Awesome to see such a great turnout for the first fitness and obstacle course challenge held by Pitt Rec featuring the newly installed MoveStrong T-Rex outdoor Functional Training Station. 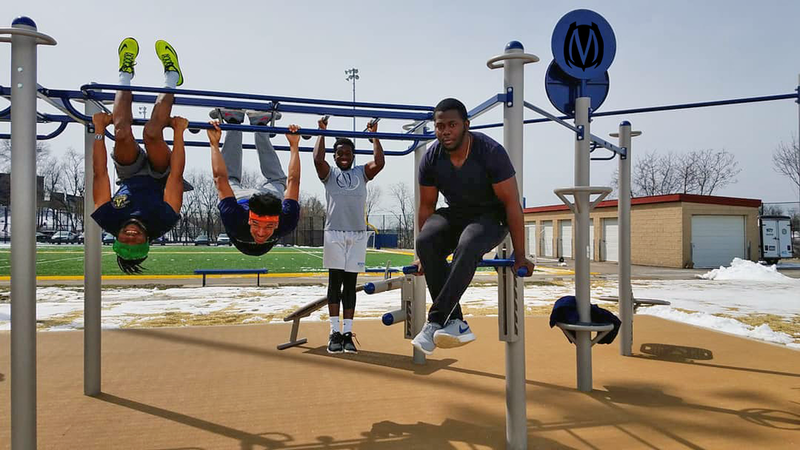 MoveStrong worked closely with University Rec staff and architects to design the perfect outdoor fitness station for space and training needs. Customized with school colors also! A 12-post T-Rex FTS with double horizontal bridge and many training features available for the ultimate in bodyweight, functional fitness, calisthenics, spartan training, ninja warrior, and cross training workouts! "We LOVE IT! We did have our opening even there on last Saturday. I am super satisfied with the T-rex. Thanks so much!" So thankful MoveStrong could help provide equipment needed for the University of Pittsburg Rec Department to keep its students and faculty moving strong with a new outdoor fitness amenity! Battle Dome Challenge Team Winners!